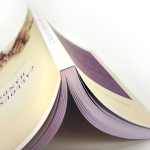 Book binding is joining collated pages of a printed piece together in some form. 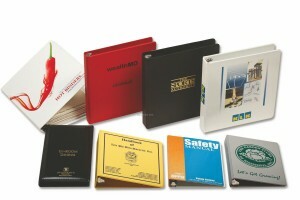 At Rhino Digital Printing, we offer a variety of book binding options. Not every type of binding works for every project. Let us know the specifications of your job so we can recommend the best option for you. Some things that effect which binding is best for a given project include: The quantity of books to be printed, size of the book, page count and paper thickness. Get a free custom quote online or Call us for more information at 503-233-2477. Perfect binding is essentially a paperback book. 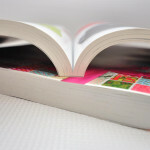 The pages are collated together, then glued at the spine with a strong yet flexible glue. A card stock cover is attached over the glued spine and the other three edges are then trimmed for a “perfect” finished edge. The finished piece is just like a paperback book. Note: We do not recommended perfect binding for books that have fewer than 40 pages (20 double sided sheets of paper) or are less than 1/8” thick. Due to setup costs, perfect binding is usually reserved for runs of 50 books or more. 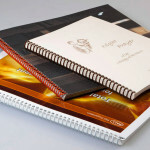 Saddle stitching is a type of book binding that is ideal for booklets with smaller page counts. We recommend between 8 and 60 pages for this type of binding. The printed sheets are folded and collated one inside the other and then stapled twice in the centerfold. Finally the booklets are “face trimmed” so the open edges are all the same length for a nice clean looking finish. 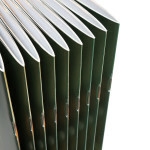 Note: Saddle stitched booklets must have page counts divisible by 4 since each sheet of paper when folded has 4 panels. 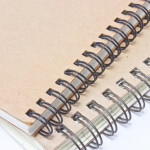 Wire-o is a binding in which pages are bound together by a wire coil. To do so sheets are collated together, holes are punched along the binding edge and a continuous double series of wire loops are inserted. 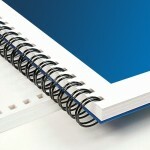 This type of binding easily lays open flat and is good for workbooks and reports. We also carry silver and black wire in most sizes and can special order colored wire for larger projects. Coil binding, also known as spiral coil, color coil, plastic coil, and plastikoil, is very similar to wire-o binding except the pages are bound with a piece of plastic coil that is threaded into drilled holes along the binding edge. The coils come in different colors, however we stock only black in house. Let us know if you would like other colors and we can place a custom order. This binding method is a way to join collated loose pages into book form. The sheets are three hole drilled and hand placed into three ring binders often with collated tabs. 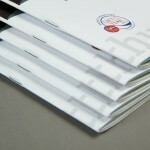 The binder is made with a clear plastic overlay, which allows printed inserts to be slipped in for the cover and spine. Need help finding the right book binding type for you? 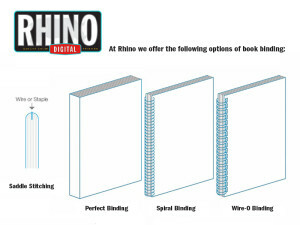 Contact Rhino Digital Printing today for a free estimate on your next print binding project!